The beauty of the internet is that we can learn about things that we would otherwise not experience in our lives. We gain access to information and products that might have been out of reach before. The downside of the internet is that sometimes it introduces us to things we still can’t have. For years now, I have been reading about Meyer lemons. They grow well in places with warm climates and most of the fruit becomes ready for picking in the wintertime. If you plant Meyer lemons from seeds, it takes more than four years for the plant to produce lemons. But most importantly, they are a hybrid citrus combining the tartness of lemons and the sweetness of oranges. Who wouldn’t want to try such a lovely fruit? 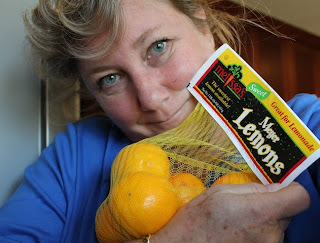 If you follow my Facebook page, you know that I finally live somewhere that Meyer lemons are available. Sadly, I don’t mean they are grown locally, although there is really no reason they couldn’t be, but they are imported for sale at my nearby grocery store. I struggled with the outrageous expense and the fact that they had been flown clear from the other side of the world. And then I broke down and bought some. Lovely, truly lovely. My bag had only six lemons so I had to choose my recipes carefully. But I knew when I first cradled that yellow mesh bag in my eager arms, that upside-down cake would be one of them. Slice your lemons very thinly and remove the seeds from the slices. Starting in the middle, cover your sugar butter mixture with the lemon slices, overlapping them ever so slightly. As you get to the outside, you may have to cut some slices in half to achieve full coverage. Slowly pour the batter over the lemon slices in your baking pan. Smooth out the top with your rubber spatula. Bake for 30-40 minutes or until golden on top and a toothpick inserted comes out clean. Gently lift the cake pan off and then peel the parchment paper off of the cake. If any lemon slices have stuck to the parchment, ease them carefully off with the tip of a knife as you peel back the parchment. This wonderful cake is sticky and tangy and sweet. It will be most appreciated by anyone who is a fan of marmalade. Or Meyer lemons. Or cake. I took this to a dinner party so I don’t have any photos of the cake being cut but I can tell you that each slice was served to warm acclaim with a generous dollop of crème fraîche. I suggest you do the same. This looks incredible. I'm lucky enough to have meyer lemons in my yard, and just got a pile of a neighbor's mystery lemon-oranges — not meyers, but yellow, lemon-shaped, and sweet (if you let them sit a week after picking). Clearly, I'll need to bake one cake with each variety. I have heard something about baking upside-down cakes in cast iron skillets, but I wonder if the lemon from the acid would react and make a terrible mess. Thoughts? My mother is a collector - some would say hoarder - of cast iron pans and pots. If well seasoned, she would tell you that there is no more non-stick surface. That said, I don't think she has ever baked a citrus upside-down cake in one. What's the worst that can happen? It might stick (which you can avoid with a layer of parchment paper) and you'll have to pry it off, but you can never ruin a cast iron pan. A good scrub will see it right. Let me know how you get on! This looks fantastic! I'd love a big slice for dessert tonight! A thing of sunshiny beauty!! I've never heard for this but we love lemons and this would make a great dessert! G'day! Your photos look amazing, TRUE! Thanks for the hint and tip...very handy indeed too! Thanks, Sarah! I wish I had one to offer you. I don't know if real lemons would be too tart, but I suppose that depends on your taste. My own mother-in-law eats the lemons when I roast them with chicken! Thanks, Joanne! I appreciate your kind words. YUM!! I have always wanted to try an upside down lemon cake. Question: do you ever worry about the pith making it bitter? With normal lemons that might be an issue, Laura but the Meyer lemons, being a hybrid of lemons and oranges, aren't as bitter. There was still something marmalade-y about this though. That is to say, a good mix of bitter and sweet. That looks so good. I definitely have to try that.